Biologics International Corp (BIC) is one of the recognized recombinant antibody experts who has extensive expertise and research experience in building advanced phage antibody libraries in varied formats and display types. BIC offers non-immune libraries (naive and synthetic libraries, containing 1 billion to 1 trillion independent clones) and immune libraries (at least 5-100 billion independent clones). If none of the abovementioned libraries meet your requirement, please contact us, and we will try our best to set up a custom library for you. Phage display is a widely used laboratory technique that uses bacteriophages to associate proteins with their respective genetic information for studying protein-protein, protein-peptide, and protein-DNA interactions. In this technique, gene segments encoding the antibodies are fused to genes encoding the coat protein of a phage, causing the phage to "display" the protein on its outside. One of the most valuable advantages of phage display is the enormous diversity of variant antibody genes. Millions or even billions of recombinant phages (the most common bacteriophages are M13, T4, and T7 phage), each displaying a different antigen-binding domain on its surface, are known as a phage display library. Compared with the traditional hybridoma method, phage display library has enormous advantages in discovering novel antibodies for therapeutic and diagnosticapplications or researches. BIC's phage display libraries contain a collection of over 50 billion distinct fully human antibodies, allowing you to select the required antibodies with high affinity and specificity. Furthermore, BIC could detect the interaction between displayed protein and those other molecules or isolate specific target by using GST pull-down or CO-IP strategies. 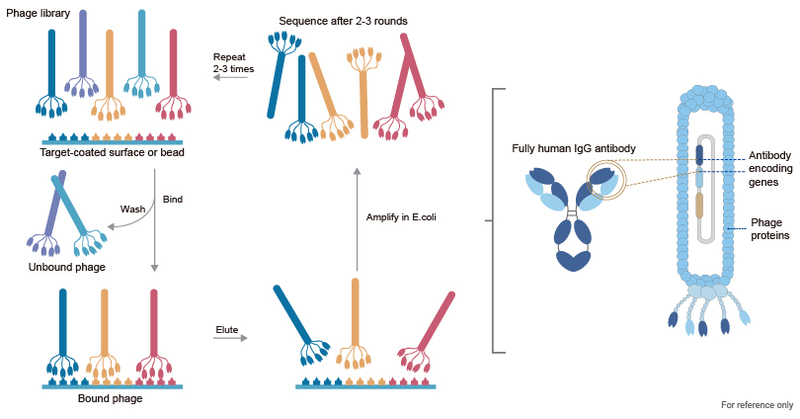 Antibody libraries are constructed by the genomic information codingvariable region of antibodies, which could be both human plasma cells and splenocytes from naive or immunized animals. Basically, the following two strategies are used to build display antibody libraries: using random combinations of variable region of light chain (VL) and variable region of heavy chain (VH) encoding genes to build these libraries; another approach is that human VL and VH sequences are designed by amplifying the variable gene sequences of one or more individuals. The key to building a successful antibody library is sufficient diversity, which is vital to screen antibodies for any given antigen. Through DNA manipulation, millions of gene variants are assembled to be displayed on the surface of the phages as Fab or scFv antibody fragments. Our in depth knowledge of phage display and scientific expertise in antigen preparation, has result in construction of high-quality libraries with the diversity of 108. For more information or a quote get in touch please. BIC antibody libraries with rich diversity and large scale, are ideal for screening all antigen types for selection of functional antibodies with high affinity. With years of experience, we have developed several phage platforms that can customize a particular library for you. 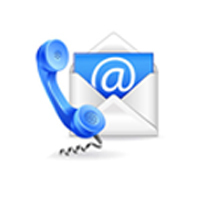 If you are interested in starting an antibody project with BIC, please contact us. You may need other services, such as antibody sequencing, scFv / Fab, and Fc fusion proteins.